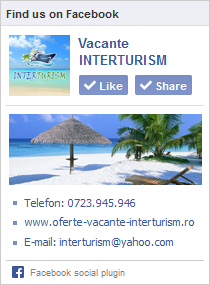 MINISTERUL DEZVOLTARII REGIONALE SI TURISMULUI – http://turism.gov.ro/autorizare-turism/ACCESATI aici – AGENTII DE TURISM LICENTIATE (AUTORITATEA NATIONALA PENTRU TURISM). DATE SOCIETATE: INTER-KRT SRL, C.I.F. : 35646951, J8/330/’16, AGENTIA INTERTURISM CU LICENTA NR. 164, BREVET NR. 9415/2004.